Once an idea has been developed, there needs to be a plastic molding design made before any plastic molding can take place. This can range from a crude sketch on a restaurant napkin to a full blown CAD design program, but the concept is the same: how to get the idea manufactured into a plastic molded part. It could be one of numerous types of mold as well. Probably the most common is an injection mould, or mold, but it could also be thermoset, compression, vacuum, blow mold, RIM, rotational, or a silicone rubber mold. Each of these is quite unique, but have many features in common. Many mold designers came up through the ranks of mold making and have a very good grasp on what is required to build a mold. Other designers learned their skill at a technical college that specializes in industrial design, mold making and machine tool design. Using a CAD design program, such as Unigraphics, Solidworks, or Cimitron has many advantages. 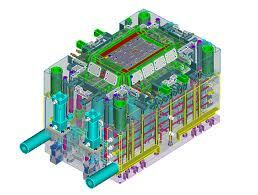 These are powerful CAD/CAM programs that have integrated features which streamline the process. Take, for example, an injection mold. This is a complicated tool that often contains moving parts, such as slides, lifters, ejector pins and core pins. It might also utilize a hot runner system, such as a Moldmaster or Inco system. Designing a plastic part with a CAD program enables the designer to visualize in realistic 3D how these moving parts will interact with the rest of the mold. This makes the job much easier and helps to eliminate errors downstream. On the other hand, it also tends to make the job more difficult because the people designing the plastic part are also using a similar approach and they incorporate many functions into one product. This results in a very complicated part with many features that must all be machined into the mold. Most companies that build mold for plastic have in-house designers, but some use free-lance designers who work from home. Both approaches work, and each has it’s own benefits. Obviously, with an in-house designer it is much easier to communicate. There is no scheduling, no conference calls, no waiting for emails and file transfer. This, of course, requires paying the salary and benefits of a full-time employee, which is not always the best solution. An off-site designer is less expensive and, when done right, can be available for consultation and questions. These days, with the ease of internet communication, time and space are less of an issue than in the past.